Thank you so much for helping kids like Jacob, you are a superhero! 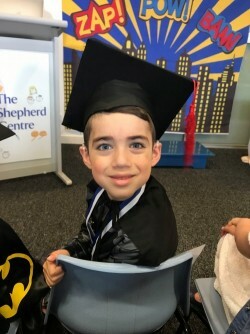 Your kind gift means children like Jacob will set up for a lifetime of success. Your gift helps to give every child like Jacob the confidence they need to succeed in the classroom and beyond. On behalf of Jacob’s family and all the families that receive support at The Shepherd Centre, thank you! The help these families receive is only possible because to you.